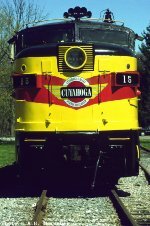 Title: Cuyahoga Valley Line logo on the nose of this unit speaks of an early time in the operation of this fine tourist line. Title: Seen crossing Howard St. Having finished it's station stop. Description: The second bridge right behind the first has been removed. Can be seen in my B&O boneyard album, thanks. Title: Sporting a CVL herald this unit is facing east or railroad south at what would become Akron's Northside Station. Description: CVSR #15 wearing fresh paint after being painted recently. Description: Second shot from a slight different angle. Description: Date and location is correct. Description: This is today's CVSR 6771. Title: CVSR 15 before its renumbering, new paint, and ditch lights. 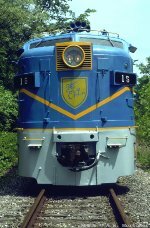 Title: CVSR 15 in Penninsula. Title: A July 1989 shot. Title: Crossing Howard St. heading North. Description: Close your eyes and think D&H PA4s. Notice the rail to the right? A distant memory. Title: Then there was this paint in July 2000. Description: I liked this paint too.